Dexter Dennis shows off his athleticism and slick Kyrie kicks to grab a loose rebound. One of the best kept secrets in the 2018 recruiting class is finally out of the bag. He goes by the name of Dexter Dennis and is a 6’5” combo guard out of Believe Prep Academy in Athens, Tennessee. Dennis is an explosive leaper and has an impressive pull-up jump shot that he tries to emulate after a certain player. “I try to model my game after Russell Westbrook. I try to use his style of play while using Kobe’s mindset,” says Dennis. Georgia Tech is recruiting Dennis to play to the 2 position, with the belief that he would have the ability to play the 3 when called upon. Dennis has already heard a lot about Georgia Tech and its prestigious academics, and he's excited to head back to campus to learn and see even more. “I’m looking for a place like home, with genuine people, coaches, and a great learning environment,” states Dennis. Coach Julian Swartz is leading the way for the Jackets and is making it known that Dennis is a priority, “Coach Swartz has been talking to my head coach a lot. Coach Pastner and my head coach also have a great friendship and relationship together.” Right now, Dennis does not have a top list of schools and has been recently offered by Wichita State, Ole Miss, and Middle Tennessee State among others. “Most likely, I’ll decide after I take all my visits,” Dennis says. Dexter Dennis says he has been to Atlanta a couple of times and knows that it is huge and busy. “I have a feeling I’ll get to know even more about it.” There are a couple of things from Atlanta that Dennis needs no introduction to though, particularly when it comes to his go-to pregame activities. “I sometimes eat a lot of Waffle House before games. I don’t see anything wrong in the All-Star Special.” I think I speak for my fellow natives of Atlanta, he is absolutely right! The other connection between the city and Dennis is his pre-game music. “NBA Youngboy is leading the way, right in front of Lil Baby. Listening to their music instantly puts me in the zone,” states Dennis. To me, that sounds like music to Coach Pastner’s and Georgia Tech’s ears. As long as Dexter Dennis continues to work hard and put the time, he will be successful. If that is at Georgia Tech or at another institution, that is still unknown. What I do know is, someone is getting one heck of a steal. 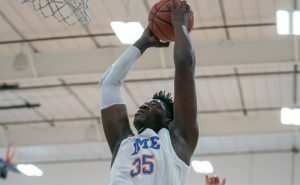 Standing 7’1” out of DME Academy in Daytona Beach, Florida is big man Assane Diouf. The 280-pound center, newly classified to the 2018 class, is an intriguing prospect originally from Senegal like Tech’s own Abdoulaye Gueye. When Diouf is not vibin’ to Kodak Black, he is on the block or in the paint, where he knows he does most of his damage. “Right now, the strongest part of my game is my footwork,” said Diouf. “I try to model my game after Joel 'The Process' Embiid and Hakeem Olajuwon.” Assane Diouf runs the floor extremely well and is very agile for his size. He credits playing soccer growing up with helping his mobility. While Assane protects the rim well and can throw down powerful dunks, he still has some developing to do. “The weakest part of my game right now is my ball handling,” stated Diouf. As many now recognize, Georgia Tech’s big man coach Eric Reveno is a wizard with big man development. That can only make you excited when you think about the possibility of Diouf working with him. A random fact that should make Georgians happy: Diouf’s favorite food is Chick-Fil-A. More importantly, he would like a career in business once his basketball career is over. That could make Georgia Tech's renowned Scheller College of Business a factor in his recruitment. According to Andrew Slater of 247 Sports, Diouf has offers from Georgia Tech, Rutgers, UMass and Coastal Carolina, among others. He is also receiving interest from VCU, TCU, Baylor, and New Mexico. He has a top 5 but is not quite ready to release it yet. Diouf has been to Atlanta twice and says he plans on visiting schools again in April and, “within a short time, I should know” on when a commitment is coming. Thursday night at McCamish Pavilion, the Virginia Cavaliers, the #2 team in the country, come to town...of course, ice and snow permitting. Virginia is 16-1 on the season and 5-0 in ACC play. They currently sit atop the ACC standings but might be moving back after a battle with the #3 team in the ACC, the Duk.....Georgia Tech Yellow Jackets. Leading the Cavaliers is Seth MacFarlane’s long-lost brother, Tony Bennett. The two-time National Coach of the Year and in his 9th season at Virginia, Coach Bennett is the other half of Coach Pastner’s get old, stay old motto with Notre Dame’s Mike Brey. Tony Bennett is known for his grind it out defense and working the clock for a good shot on offense. While this type of game plan does not attract the 1 and done guys, UVA has been able to land those four-star players that are super talented but need 3-4 years of development to go pro or be a really solid college basketball player. So far this year, it is no different. The Cavaliers are still playing rock solid defense, but they added something that was missing in the past...offensive weapons, and even scarier...from multiple different players. To start it off, I will begin with probably the most notable player on the UVA roster. Even though he has let down thousands of people on Twitter by shaving off his man bun, the 6’2” sophomore #5, Kyle Guy is still a fan favorite. Guy is averaging 15.5 points per game and is shooting 44% from behind the arc. If you need a reference, think of Fletcher Magee from Wofford. He can flat out shoot the ball, plain and simple. Now that you have wiped off your sweat following Magee flashbacks, we can continue breaking down Kyle Guy. He has added a nice pump fake and pull up if you close out too strongly on three-point attempts, along with a nice floater if he gets closer to the rim. Defensively, he has been improving and is now constantly sliding his feet, moving over to take a charge and getting those slap down steals that lead to fast breaks. Due to his size, it will be interesting to see if Tech tries to get Tadric on the block against Guy. Especially with a good defender in Devon Hall focusing on Okogie. Speaking of Hall, #0, he is one of the biggest pieces for Virginia as a 6’5” redshirt senior. The lefty is averaging 12.5 points per game and is shooting 47% from three. He usually plays the 3 in the lineup and can do a little bit of everything for UVA. Hall has nice court vision, hits open shots, and plays tough defense all game, as you will see is a trend for all these Virginia players. Not much more to say. Hall will play hard and get the job done. Every. Single. Night. Here comes the “Human Highlight” #21, Domin....Isaiah Wilkins. The 6’7” senior out of Greater Atlanta Christian Academy, previously known as “oh hey, that’s Dominique’s kid” during the first two and half years of his career at UVA, is now a vastly improved, above average ACC player. He has always had the athleticism and energy, but has finally put it all together. If you don’t believe me just look at college hoops and one of GTSwarm's posters favorite's, Jon Rothstein’s twitter. Book it. It seems like every game he tweets “Isaiah Wilkins, ultimate glue guy” and that is what he is. His defense is spectacular and at the moment, I say he wins ACC Defensive Player of the Year. Now that he has added an offensive game, he is a serious threat and someone that needs to be held in check. The other guard for UVA is the 6’5” sophomore out of New York #11, Ty Jerome. Even though he was rated a 4-star by most of the services, I believe he is severely underrated. As you might be shocked, he is sound player that does a lot of things right (they have those at UVA?). He can shoot it, play defense as he loves to get the poke from behind steals, and works the ball around to the open teammate. It seems like he is always the one to make the extra pass to Guy in the corner for the three and assist. Despite not wearing any accessories or having the “off the bus factor”, Ty Jerome is a baller. The big man for Tony Bennett is #33, Jack Salt. Not only does his name sound like some fake name celebrities use when booking a reservation, but the 6’10” redshirt junior out of New Zealand has a lot of skill. He feeds off of drop-off passes in the paint for the two-handed jam and hits the backside offensive glass for easy put backs. He has a huge frame much like Purdue’s Isaac Haas and is a force down low. You are not going to move him out of the way, and if he boxes you out like he typically does, you might as well start running back on defense. Though, an area where Salt struggles is with fouling. He tends to hack and reach when he does not need to. If Lammers or AD are at the line a lot tonight, Tech should be in an advantageous position. The wild card for Virginia is the redshirt freshman out of Philly #12, De’Andre Hunter. The 6’7” wing who was upset that he had to redshirt last year, has come out with a mission in his first campaign. If you could go to a factory and design a body type for a wing, Hunter would be the model to use. With the help of his athleticism, he has brought some needed change of pace and high-flying action to Charlottesville to go along with the great defense and ball movement already established. The two other players that typically round out the UVA rotation are 6’1” grad transfer from Rutgers #23, Nigel Johnson, along with 6’9” redshirt sophomore #25, Mamadi Diakite. Out of the two Johnson is the shooter and Diakite is the slasher. Diakite's jump shot is still a work in progress, but his vertical needs no work. Like Hunter, he comes off the bench with energy and tries to get some fast break dunks to extend the lead while the starters get a little rest. When Johnson comes in, he is in there to keep the offense moving, make the smart upperclassmen choices with the ball, and hit the open shot when available. It’s caught by Devonta Smith for an Alabaaaaama touchdown!! 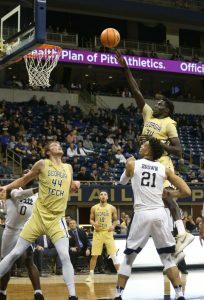 As Alabama’s confetti fell in Mercedes Benz Stadium last night, the Georgia Tech Yellow Jackets basketball team was resting up for the always tough Notre Dame Fighting Irish that are coming to town. The Irish are 12-3 on the season with losses to Ball State and Indiana (both by 3) along with a 63-81 loss to Michigan State. Unfortunately for Notre Dame, that is not the biggest loss of the season. Instead that comes in the form of losing last year’s ACC Player of the Year, Bonzie Colston for 8 weeks with a foot fracture. Senior guard and fellow upperclassmen Matt Farrell is also expected to be unavailable for the game (ankle), but who knows, Notre Dame could pull a Coach Pastner and he suits up and plays. I don’t expect them to make that move with more important long-term postseason thoughts, but you never know. In his 18th year as the lead man at Notre Dame is Coach Mike Brey. He is highly considered as one of the greatest coaches in college hoops right now and one of the inspirations of Coach Pastner’s “get old, stay old” philosophies….and boy does Brey do an excellent job of it. Without Colson and Farrell on the court to provide that senior leadership, Coach Brey will turn to a fellow upperclassman who stands 6’6” out of Mater Dei High School #0, Rex Pflueger. Not only does his name sound like a cousin of a super-villain but it is also a pain to spell out. A “f” after a “p” seriously, come on guy. Even though his hair and name are annoying, he is a really really solid basketball player. Was the second “really” necessary? Yeah, probably not, but I don’t want you fooled. Pflueger rarely comes out of the game, and will be trusted to do a plethora of things for the Irish. He hits the open shot, grabs the tough rebound, makes the extra pass to his teammates, and will give up his body for a charge (a Notre Dame player taking a charge..you don’t say?). He will more than likely get his 14 points and 7 rebounds, while playing solid hard defense. Tech just can’t let him get fired up and start making crazy shots/plays. If you keep him in a supporting role, you can be successful. 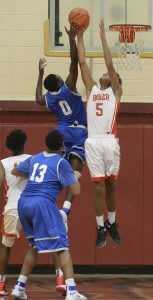 For Notre Dame, the next couple of words are rarely linked together: the impact freshman standing 6'6" out of Bowie, Maryland #3, DJ Harvey. He already has the body for the ACC and the mindset to go along with it. He has no problem shooting the ball, even if there is a better option or his shots aren’t falling. In my opinion this is the guy Tech should force to beat them. Put the pressure on the talented but unproven freshman on the road in the Thrillerdome (trademark pending, I feel like this will catch on). With an even bigger role down on the block with Bonzie out is the 6’10” senior from Vilnius, Lithuania #23, Martinas Geben. Not only is this guy from the same country that is hosting Peac’s favorite family, he is also the fifth European player to play for Brey at Notre Dame. He is averaging 8 points and 7 rebounds on the year and he plays as you might imagine. Big and strong, he hits the boards hard and hits the defenders with screens even harder. They like to get him the ball at the high post and do pick/ball hand-offs to the scorers on the wing for an easy shot. This is a game where Ben Lammers will need his healthy legs to grab those boards, because you know that Geben will be making contact trying to box out. The Fighting Irish will also turn to a duo of upperclassmen #12, Elijah Burns and #1, Austin Torres. Out of the two Burns is by far more of the scoring threat while Torres is a graduate transfer that is straight energy, and it doesn’t matter if it’s off the bench or starting as he goes all out. The final key piece for the Irish is the 6’9” sophomore big #33, John Mooney. He is still young but can stretch the floor and has the body to compete down low. Prediction: This game is set up for Lammers to have a nice game if his mid-range shot is falling. AD will be posting up on the block or at the top of the key to get Geben to guard him, which means Lammers will have someone smaller guarding him. Therefore Ben can easily shoot over whoever with a normal jumper or a vintage Dirk’Lammers fadeaway. I feel like Alvarado can get some back-side poke away steals from Harvey in transition and Tech runs the floor for a basket. *paging a Tadric euro step finish*. I keep wanting to pick Notre Dame because of all the talent they have, but I also can’t get over how well we play in ACC games at home. So, it basically came down to one thing. Josh Okogie. We have him, they don’t. Pretty deep analysis there, huh? Gibbs Jr. step over, the real sophomore baller is comin' through. Okogie drops 36 and Techs wins by 5.